The elderflowers are blooming and I have already made my Elderflower Cordial (see my recipe here). I love going up into the woods – just me and the trees – to pick the huge scented flowers. That’s what I call aromatherapy! But I still had half a small bottle of last year’s cordial left, which had been eked out over winter. Time to use that up! 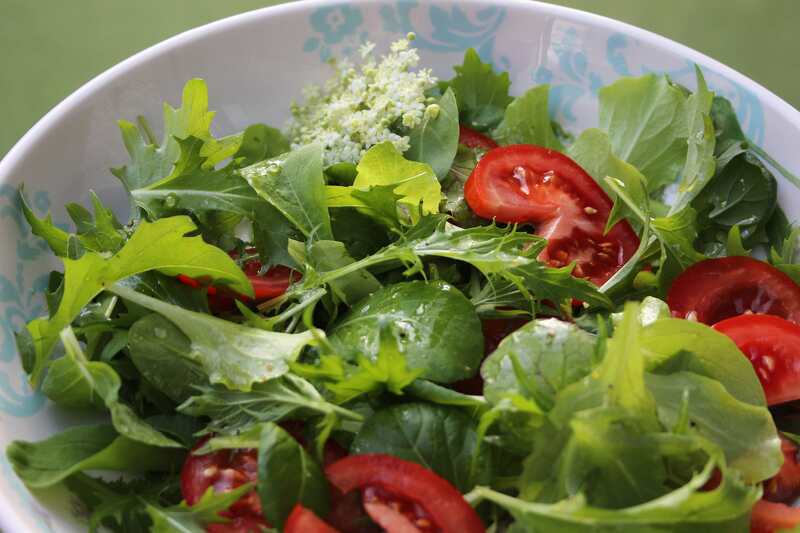 This is hardly a recipe, more of a suggestion… add some to your salad! 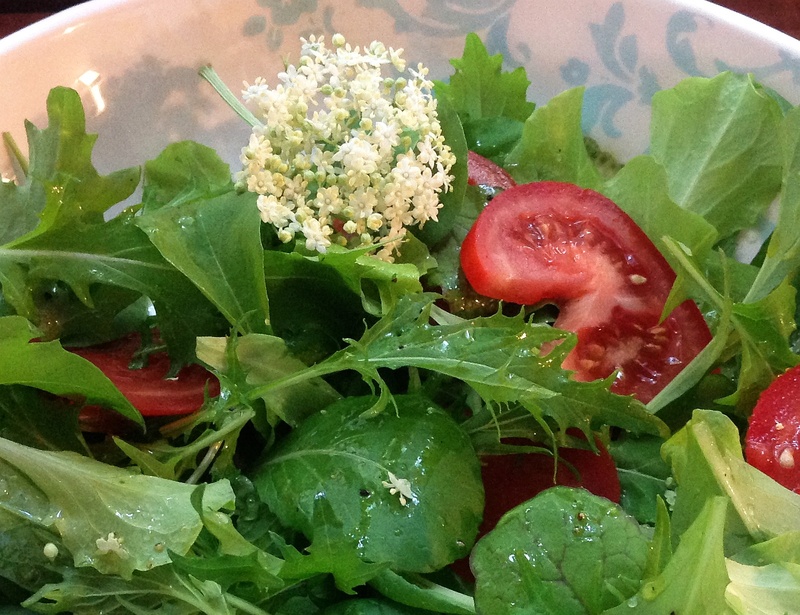 I used my homegrown salad leaves, but any salad will do. Mix 2 tbsps olive oil, 2 tbsps white wine vinegar, 2 tsps elderflower cordial, and a little black pepper. And enjoy the taste of summer! Do you have elderflowers grow near you, and do you use them for anything? This entry was posted in Countryside, Food, Nature, Recipes, Vegetarianism and tagged Countryside, Food, Nature, Recipes, Summer. Bookmark the permalink. I made my cordial this year with Sambucus nigra. The pink flowers have given my cordial a lovely pink colour. I never thought of using it for salad dressing. I bet that looks really pretty! Does it have such an intense flavour as the white? PS Is your elder tree called ‘Black Lace’? Sadly, I’ll have to enjoy this from afar, but glad you can. A shame you don’t have elderflowers Susie. The perfume in my garden has been almost overpowering this year! We don’t but I’m so inspired by yours. That salad looks delicious. The elderflowers are opening here now – if I can get hold of some citric acid, I’ll be making cordial next week… last year it was impossible to buy any. Adding some cordial to a salad dressing sounds good, a nice bit of sweetness to balance the vinegar. I wonder why citric acid was difficult to find. I buy small sachets (Dr Oetker) and use it to descale my kettle too! Hope you find some! We do not have elderflowers (as far as I know!) but your salad looks lovely! The lanes here are full of Elderflowers, so there is no excuse for not using them. Your salad dressing sounds light and refreshing, I’ll certainly use that thank you! It’s so nice when we can use wild flowers and berries for the kitchen. Have fun picking your flowers… that’s the part I like best! 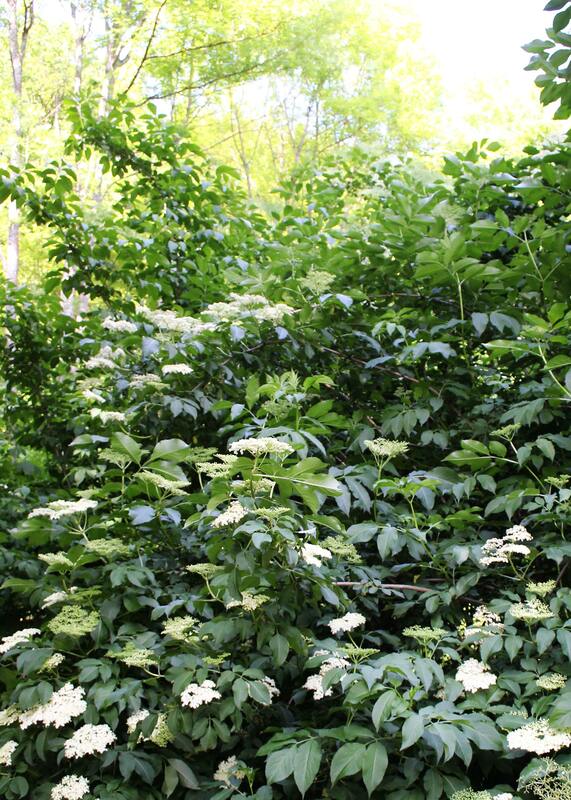 I was going to ask what species of elderflower you have there, but in a previous post of yours I found that you identified it as Sambucus nigra. That turns out to be a native of North America, and we have some elderberry (as we call it) bushes growing wild right here in central Texas. Here’s how my largest botanical reference book describes the genus: “A temperate and subtropical genus of 9 species of shrubs and small trees often with alkaloids and extrafloral nectaries; some are cultivated as ornamentals or used for their edible fruit; however, some species have toxic fruit.” An elder [pun intended] friend of mine here who’s also a fan of wildflowers told me some years ago about the tradition of making pancakes with an elderberry flower head in each, something I’ve yet to sample. They say the berries should not be eaten raw or in large quantities as they can cause nausea and stomach cramps, but a handful in an autumn crumble is delicious! Yes, that was the previous post of yours I’d found. As you’ve heard me say before, I wish you could send some of your kitchen handiwork to us over the Internet. Maybe someday. Sounds a good idea…as I’ve just made some cordial I shall keep this in mind. Lots of elderflowers around every corner…one year I made champagne and it was a joy to watch the cork pop from the bottle. It was so sparkling and delicious but you need to harvest the flowers on a very hot and dry day to succeed. And healthy too Arthur! 😉 Thanks for commenting! Such a lovely salad! You have captured the bright fresh flavors of the transition from spring to summer! Thank you Deb! And salad is on the menu every day this week with an early heatwave. 😉 Glad I got my cordial made before it turned really hot. What do the elderflowers taste of? The salad dressing sounds really lovely. We have lots of elderflowers here this year, with huge flower heads, I am guessing the winter rains helped super size them. Hard to describe the taste… light and flowery, and refreshing too. I’ve been drinking my cordial with chilled mineral water the last few days and it is just right for this hot weather! I found that the biggest flower heads on our trees this year were far too high for me to reach, so the birds will have plenty of berries this autumn! My elderberry is just beginning to flower, but I leave them so the berries will feed the birds. I have both black and red elderberries, but I leave them all for the birds. I just read your post and now I need a snack! It looks yummy! This is interesting, putting it into salad. As always, I love flowers with scent! We use the blossoms for some sort of syrup or sometimes we make champagne. Once I have eaten pancakes with Elderberry-blossoms – was great!